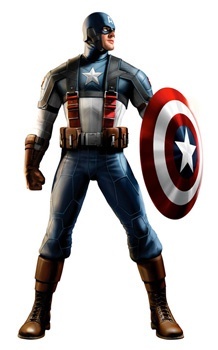 The first concept art of Captain America's costume has been released, and we're pleasantly pleased with how it looks. The star and stripes are still there, and so is the shield. The sword, thankfully, isn't anywhere to be found. Marvel is starting to let information about 2011's Captain America: The First Avenger out into the light, beginning with some concept art of how the hero will look in the film (pictured right). Fans can breathe easy, because the costume looks like it will work well in the film and won't look cheesy or impractical. Anyone who read The Ultimates will agree that the costume looks a bit like what Steve Rogers wore in that series, which was designed to look a little more military-oriented than what the Marvel Mainstream wears. It's not exactly the same, but both the film and the Ultimate version of Captain America wear looks functional and utilitarian, complete with a gun holster and removable helmet. Fans of the original costume shouldn't be too upset, though, since director Joe Johnston has confirmed that Cap will wear a similar outfit when he performs for the USO in the movie: "The costume is a flag, but the way we're getting around that is we have Steve Rogers forced into the USO circuit. After he's made into this super-soldier, they decide they can't send him into combat and risk him getting killed. He's the only one and they can't make more. So they say, 'You're going to be in this USO show' and they give him a flag suit. He can't wait to get out of it." The plot of the film is about what most people expected: Steve Rogers (Chris Evans) volunteers for an experimental military treatment that transforms him into a hero for America during WWII. He goes up against the Nazi hordes, eventually coming face-to-face with the sinister Red Skull (Hugo Weaving). Leaked information has indicated the setting of the first Captain America movie will be set during WWII, but the presence of the Howling Commandoes and Howard Stark have been confirmed, helping maintain the sense of continuity amongst all of Marvel's new film releases. Of course, this isn't the first time that Cap has appeared in a movie. Back in 1990, a truly terrible film was released starring Matt Salinger (son of acclaimed author J.D. Salinger) as the titular hero going up against an Italian fascist version of the Skull; the movie has since been released on Hulu, though we don't really recommend you watch it. If we're very lucky, the 2011 movie will be nothing like it.